Been wanting to do this track for a while. This injury has given me time to learn the track editor a bit better. Its not perfect, its not even close enough to really pass it off as a replica either, but its a fun track and for those who have ridden at Mtn.View (Sandy, OR) should recognize it. My buddy Sam (57rmz57) helped me with it quite a bit over the course of the last few days. The creators of all tracks listed above. 57rmz57 for helping me with a good portion of it. Hope to release the 2014 version later this year and make it a little more realistic. Hope you guys like it! SWEET! This defiantly gets me itching to go ride at Mtn View. I've put in countless lap there while I was still out riding and racing all the time. Sure its not a replica but you know that. Its a good track and fun. The only problem I ran into was the texture and object were not loading because the location are all set at 1234. After I changed the folder name to 1234 everything loaded fine so you might want to look into that. But none the less thank you for making this track it captures the feel of Mtn View so well. My teammate Jammer rode here in the late '70's-early '80's. Thanks from two PDX'ers! lol just kidding. I like the track, flows pretty good and is fast. Thanks for all the positive comments and constructive criticism! 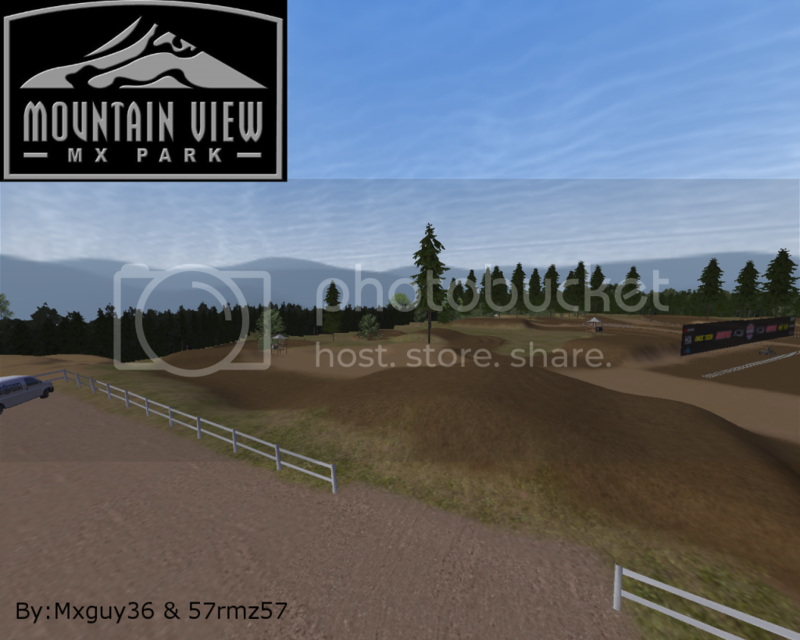 Still working on getting the hang of this track editing stuff, hoping to release a more realistic 2014 version of Mtn.View, also want to do, Woodland, PIR (TNMX), and Albany at some point. I like this track, it's fun. Thanks! "batallions of riot police with rubber bullet kisses, baton courtesy, service with a smile." mxguy36 wrote: Been wanting to do this track for a while. This injury has given me time to learn the track editor a bit better. Its not perfect, its not even close enough to really pass it off as a replica either, but its a fun track and for those who have ridden at Mtn.View (Sandy, OR) should recognize it. My buddy Sam (57rmz57) helped me with it quite a bit over the course of the last few days. Thanks dude iv wanted a NW track to be made for a whiel!!!! I work at mtn view and ride all the time in my opion its the best track in the NW!!!!! mxguy36 wrote: Thanks for all the positive comments and constructive criticism! Still working on getting the hang of this track editing stuff, hoping to release a more realistic 2014 version of Mtn.View, also want to do, Woodland, PIR (TNMX), and Albany at some point. Need a NW rolll call. TeamHavocRacing wrote: Need a NW rolll call. Sorry haven't been on here in a while, Ive been riding and working alot! Sorry to Havoc, but the next track I'm going to release will not be Woodland. But I am working on Albany, and a little bit on Riverdale. Probably going to send what I do have of Riverdale to my friend that helped with Mtn.View (57rmz57) so hes got something to do while he is out with a broken arm.